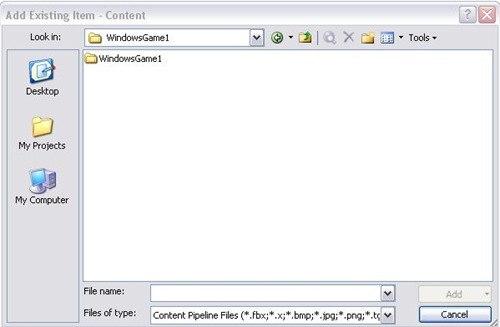 This XNA tutorial walks you through the steps required to add an image or images to your game. Before you can start drawing backgrounds, characters, power ups and all the other little goodies you plan on having in your game to the screen, you will need to add these images to your game project. The image types you can add that are supported by the Content Pipeline are .bmp, .jpg, .png and a few texture file formats. Primarily, I would recommend to stick with .png files to take advantage of the transparency those files provide. The images you add to your projects may either be single images of objects or spritesheets which contain multiple images and are often used for creating animations or used for tiles. Adding the images to your project makes them available to the XNA framework's Content Importer. This will compile them as ".xnb" files when you build your game and make them accessible to the Content Importer in the code for loading and unloading. To add an image to the game project, open up the project in XNA Game Studio Express and right-click on the Content Folder (the Content Folder is created automatically in your project when you make a new XNA game project) and select "Add -> Existing Item" from the right-click menu. This will open the "Add Existing Item - Content" dialog. The Add Existing Item dialog box defaults to show only "Content Pipeline Files", which is perfect because we will be navigating to find the image files we want to add to the project. Next, navigate to the location of your images and you should see the image file or files. You can select a single image or select multiple images to add to your project at once. Select the images that you want to add to your game and then click the "Add" button. You have now successfully added an image to your game project. If you look at the project tree, you should see the image or images that you added listed there as well under the "Content" node. Adding the images to the game project does not immediately start drawing them to the screen, you will need to do that later with some code. It does make these "assets" available to the XNA Content Pipeline and for you to use at any point in your game. Now that you can add an image to the game project, are there other ways of adding images? Try dragging and dropping an image from your PC to the Content folder in the Solution Explorer tree. Did it add correctly? 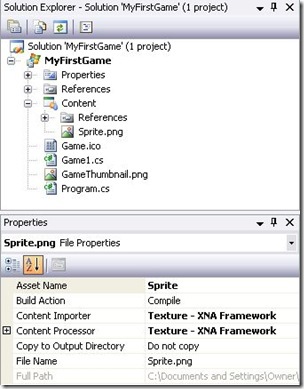 Do the properties look like they are setup correctly and is it marked as XNA Framework Content? Take what you know and build off of that. Explore other XNA sites in the community and see what else you can learn. Start with the basics and move up from there. Most of all, make sure that you are having fun!